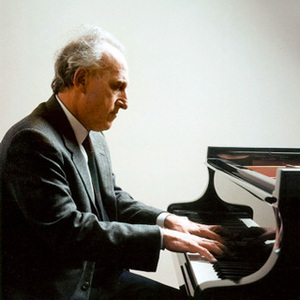 Maurizio Pollini (born January 5, 1942) is an Italian classical pianist. He was born in Milan, the son of the Italian rationalist architect Gino Pollini. Maurizio studied piano first with Carlo Lonati, until the age of 13, then with Carlo Vidusso, until he was 18. He received a diploma from the Milan Conservatory and won the International Frederick Chopin Piano Competition in Warsaw in 1960, after which he studied under Arturo Benedetti Michelangeli. He was born in Milan, the son of the Italian rationalist architect Gino Pollini. Maurizio studied piano first with Carlo Lonati, until the age of 13, then with Carlo Vidusso, until he was 18. He received a diploma from the Milan Conservatory and won the International Frederick Chopin Piano Competition in Warsaw in 1960, after which he studied under Arturo Benedetti Michelangeli. Since the mid-1960s, he has given recitals and appeared with major orchestras in Europe, the United States, and the Far East. He made his American debut in 1968 and his first tour of Japan in 1974. Regarded as one of the greatest pianists of our age, he is especially noted for his performances of Beethoven, Schubert, Chopin, Schumann, Brahms, Schoenberg, Webern and for championing modern composers such as Pierre Boulez, Luigi Nono and Karlheinz Stockhausen. Important modern works were composed for Pollini, notably Nono's ?sofferte onde serene?, Giacomo Manzoni's Masse: omaggio a Edgard Var?se and Salvatore Sciarrino's fifth sonata. He displays an absolute technical sovereignty over the piano, but is sometimes criticized for his emotional conservatism. He has conducted both opera and orchestral music, sometimes leading the orchestra from the keyboard in concertos. His first recordings for Deutsche Grammophon in 1971 included Stravinsky's Three Movements from ?Petrushka? and Prokofiev's Seventh Sonata and is still considered a landmark of twentieth century piano discography. Since then he has been one of Deutsche Grammophon's leading pianists. In 1985, on occasion of Bach's tricentennial, he performed the complete first book of The Well-Tempered Clavier. In 1987 he played the complete Beethoven Piano Concertos in New York with the Vienna Philharmonic under Claudio Abbado and received on this occasion the orchestra's Honorary Ring. In 1993/1994 he played his first complete Beethoven Piano Sonata cycles in Berlin and Munich and later also in New York, Milan, Paris, London and Vienna. At the Salzburg Festival in 1995 he inaugurated the ?Progetto Pollini?, a series of concerts in which old and new works are juxtaposed. An analogous experience will be done at Carnegie Hall in 2000/2001 with ?Perspectives: Maurizio Pollini?. In 1996 he received the prestigious Ernst von Siemens Music Prize. In 2001 his recording of Beethoven's Diabelli Variations won the Diapason d'or. In 2002 Deutsche Grammophon released a 13 CD commemorative edition to celebrate the pianist's 60th birthday. In 2007, Pollini received the Grammy Award for Best Instrumental Soloist Performance (without orchestra) for his Deutsche Grammophon recording of Chopin nocturnes.